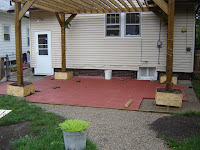 The main patio is complete to the extent that it can be without cutting block. By my estimation I'll need to cut approximately 60 blocks. That I won't do until after I've laid the path as fully as I can. So maybe next weekend I'll spend a good bit of time cutting.